Ron L. Svaty is a notoriously corrupt judge in Ellsworth County, Kansas, and the epitome of judicial kakistocracy. An overview of his outrageous paternity fraud is accessible by clicking here. Those who somehow remain unconvinced that Svaty is a monster, a list of his criminal acts, along with hyperlinks to the overwhelming evidence against him, can be accessed by clicking here. 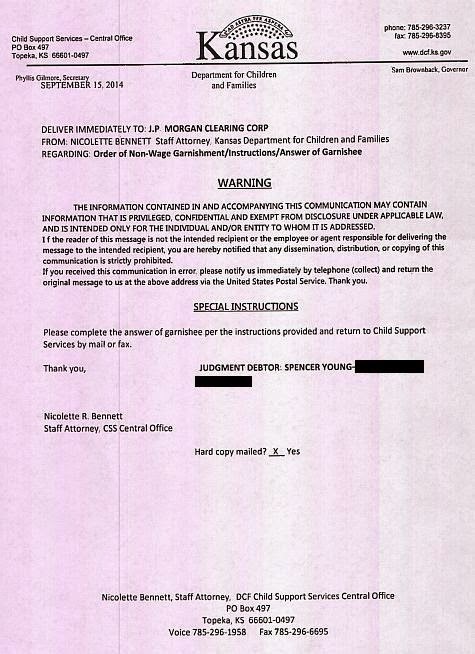 Moreover, after being tipped off about his nefarious scheme, a separate website has been established to expose and monitor his plan to falsely arrest and assassinate Spencer C. Young on behalf of Morgan Stanley in a desperate effort to prevent the publishing of his tell-all exposé, Cannibals In White Shoes, detailing his knowledge of Morgan Stanley’s involvement in criminal activities, with a unique dual perspective – to wit, as a former insider executive director and later as an unwitting target of wrath from this “too big to fail bank”. With regard to Svaty’s paternity fraud, the below document evidences perpetrating the GRAND LARCENY through a garnishment via JPMorgan Chase. This is a felony plain and simple.